OXFORD, Ohio – Connecticut is far from an elite opponent. But when a team has struggled to earn wins in recent seasons as Miami has, a dominating sweep can do wonders for a program. 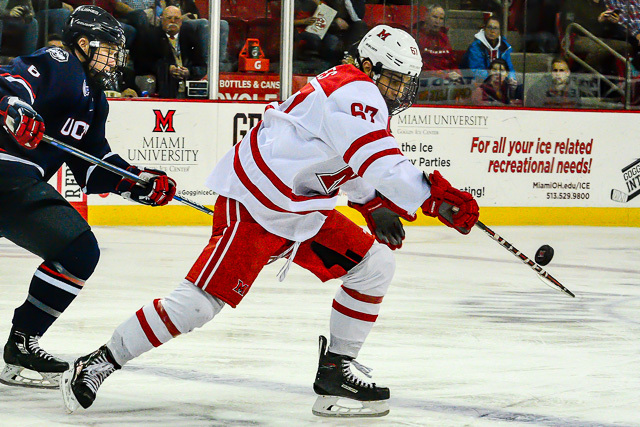 The RedHawks blew out the Huskies, 7-1 at Cady Arena on Saturday to complete a series sweep. Miami outscored UConn, 10-1 for the weekend. 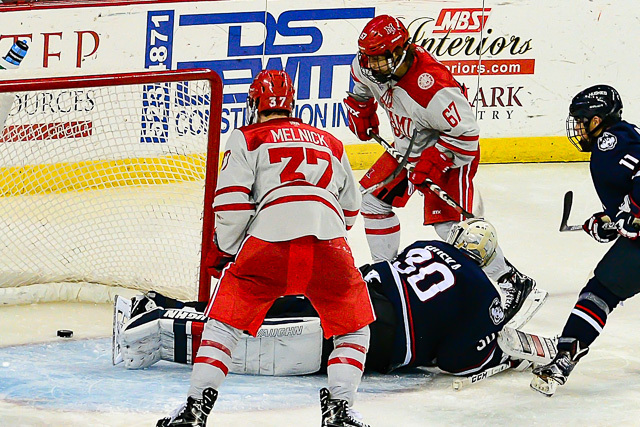 Connecticut (2-5-1) is 51st in the way-too-early-to-take-seriously PairWise, and Maine – MU’s opponent last weekend – is 54th. So Miami went 3-1 vs. teams in the lower tier of Division I. The RedHawks were 0-2 against a Providence team that’s ranked seventh. MU is presently 49th itself, which is in the bottom 20 percent. Some really good things happened this weekend. Ryan Larkin returned to form. The power play continued to excel. 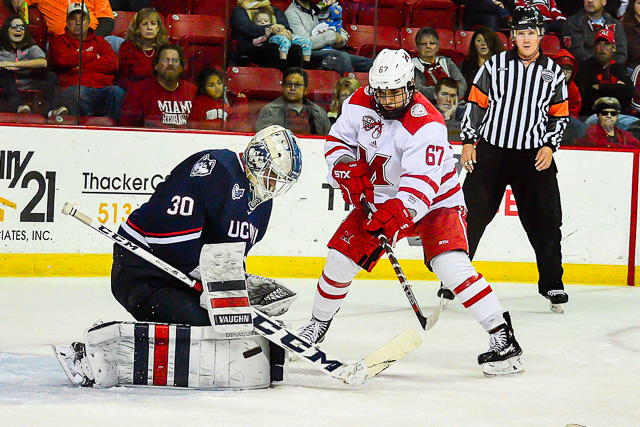 The RedHawks played much better defensively, holding UConn under 20 shots both nights. 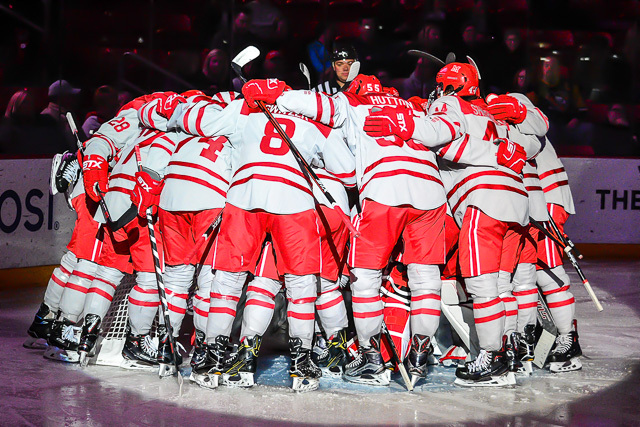 As mentioned previously, the RedHawks (3-3) needed to get back to .500 heading into their NCHC slate, which they did. But the level of difficulty will amp up substantially from here. 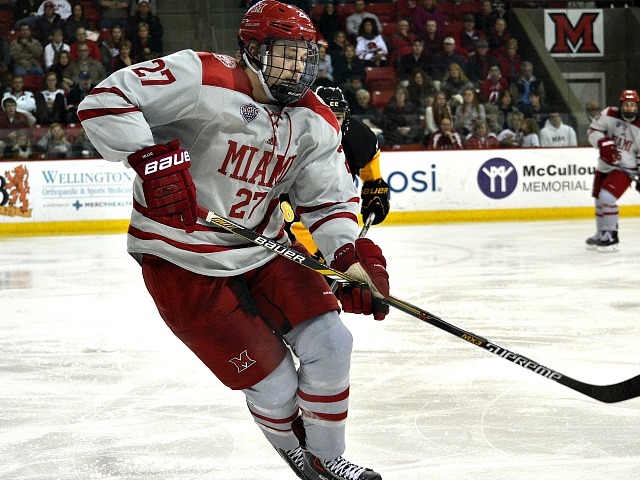 Up next for Miami is a rejuvenated Colorado College team in the RedHawks’ league openers, with both games in Oxford. Then comes the North Dakota trip. The RedHawks have shown can light the lamp against mediocre teams, but we’ll find out a lot more about this team’s make-up in the coming weeks. 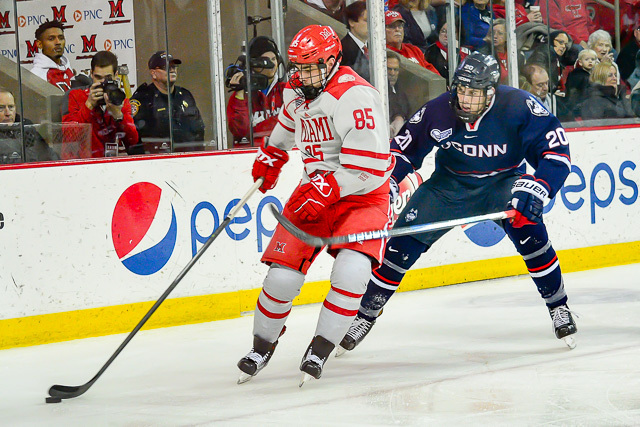 – The key timeframe in this game was late in the second period when Connecticut scored to cut its deficit to one and Miami’s response early in the third period. 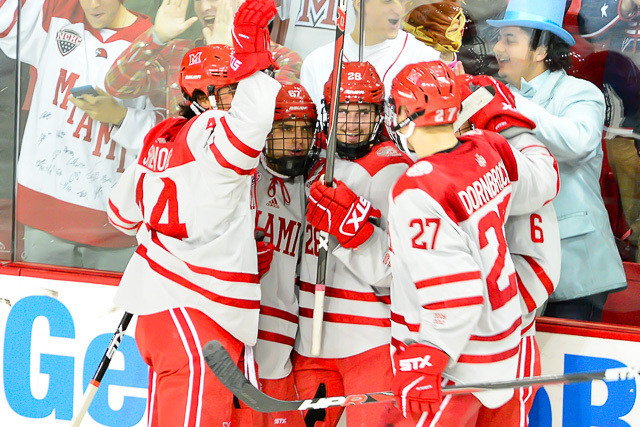 Miami had dominated to that point but led 2-1 entering the third period up with the Huskies holding the momentum. – I give Coach Enrico Blasi his staff a lot of credit for their coaching in the third period. 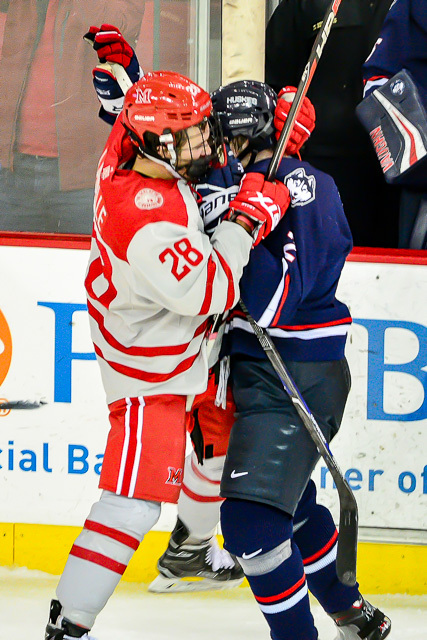 Holding leads has been an issue in the past, and the RedHawks came out with five goals to put it away. Blasi also distributed ice time very well in those final 20 minutes, allowing almost every skater to log power play time. 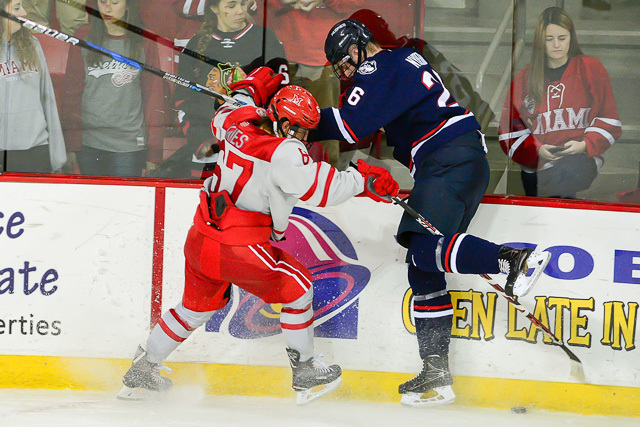 Beyond that, a frustrated UConn team took some dumb penalties out of frustration and tried to drag Miami into confrontations, but the RedHawks answered with goals instead of fisticuffs. There are times to engage opponents in that manner, but up a handful of goals against an inferior opponent is not one of them. Just in case, Blasi sent tough guys Conor Lemirande and Ryan Siroky out late. – Along those lines, surprised the Huskies mailed it in after Miami made it 4-1. UConn led the RedHawks impose their will on them the remainder of the game. – There have been very few players in recent years who have started their Miami careers slowly in terms of points and just suddenly blown up. Gordie Green is one of them. He tallied four points his first 17 games but has 28 points in 25 games since. 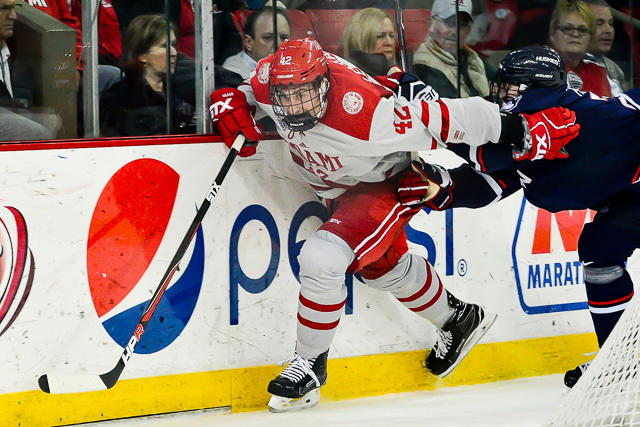 Not in any way comparing these players, but Ryan Jones and Andy Miele are two of the only players in the Cady Arena who have taken off in similar manners their sophomore seasons after pedestrian rookie campaigns. – Where was everyone? The announced attendance was 1,863 but even that seemed high. It was 1,894 on Friday. There was almost no student section either night. Word is there were several Halloween parties, but Miami has drawn just fine the final weekend in October in the past and everyone knows parties in Oxford start well after the final whistle at 9:32 p.m.
FORWARDS: A. The power play was especially brilliant, and it was inspiring to watch some of the passing and stickwork. Eight of the 12 forwards recorded at least one point. Freshman Casey Gilling was 13 of 18 on faceoffs. DEFENSEMEN: A+. All six were solid all night. UConn managed just 18 shots, and not many were high quality. And what an offensive outburst. 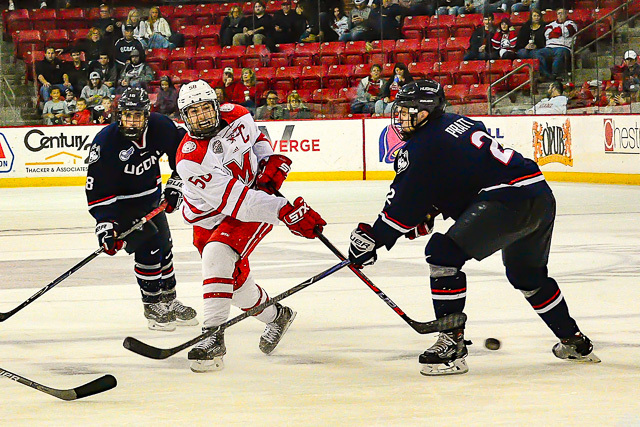 Louie Belpedio scored twice and assisted on another. Grant Hutton, Scott Dornbrock and Chaz Switzer picked up a helper each. Switzer had looked tentative at times in previous games, but this was a solid performance for the lone sophomore in this corps. GOALTENDING: A-. The shorthanded goal was a quality shot that would’ve required an above-average save by Larkin. He faced a few more Grade-A chances but stopped them all. Like Friday, the rebound control was excellent and he played with confidence. LINEUP CHANGES: There were none. All 19 skaters-plus-Larkin from Friday were back on the ice Saturday. Blasi has typically let competition play out on the ice early in the season and solidified his go-to lineup card in January, but he seems pretty well settled in most spots already. 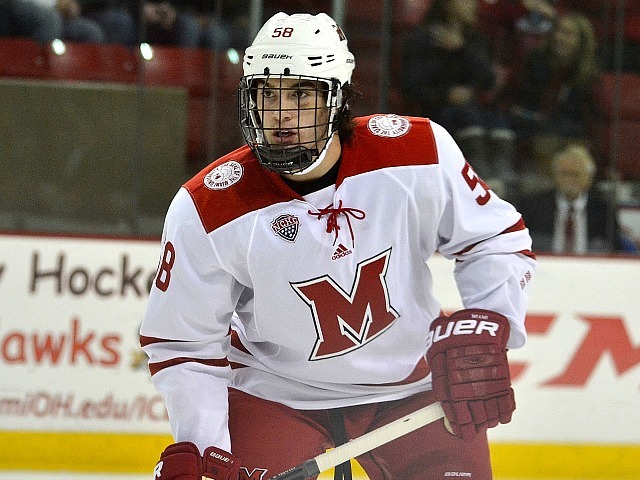 OXFORD, Ohio – For the second straight night, Miami put a game away with a flurry of goals. 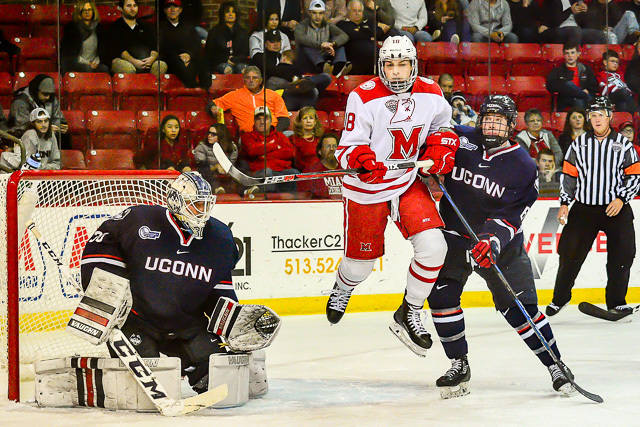 On Saturday, it was a four-goal outburst over a six-minute span of a five-marker third period that lifted the RedHawks to a 7-1 win over Connecticut. That completed the series sweep, the first for Miami since early January. Defenseman Louie Belpedio netted two goals and tallied three points, both tying career highs, and Gordie Green finished with a goal and two assists as he extended his points streak to four games. At 3:40 of the first period, Kiefer Sherwood put Miami on the board with a power play blast from the top of the faceoff circle that snuck in the short side off a feed from Scott Dornbrock. With two minutes left in the opening stanza, MU defenseman Grant Hutton carried the puck the length of the ice and temporarily lost it before regaining possession and sliding it through the top of the crease to a wide-open Green for a one-timer to make it 2-0. 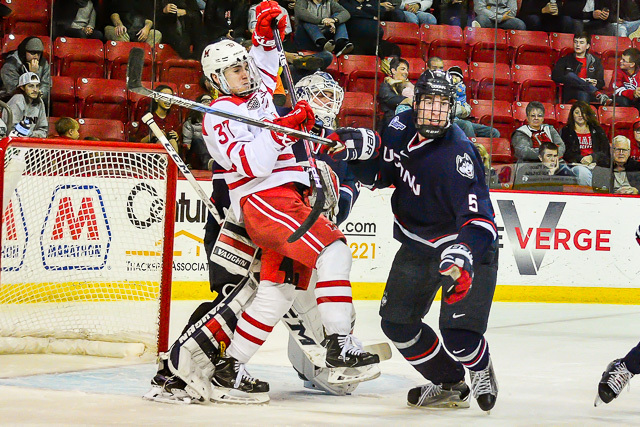 That score remained until the 18:45 mark of the second period when UConn (2-5-1) forward Adam Karashik emerged with the puck along the boards in the offensive zone, skated across the top of the crease uncontested and deposited the puck in the back of the net shorthanded. 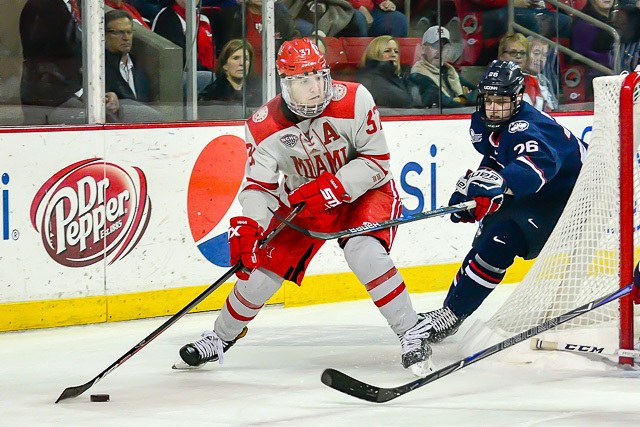 It was 2-1 at the second intermission, but the RedHawks’ offense awakened in the final frame. Sherwood dropped a behind-the-back pass to Phil Knies, who skated around the back of the net and dumped it into the open side of the cage just 1:25 into the third period. Then it was Belpedio’s turn. Josh Melnick skated behind the net to the sideboards and connected with Gordie Green in the faceoff circle, and he sent a pass to Belpedio for a high wrister that snuck under the crossbar less than two minutes later. Green next set up Melnick, feeding him at the top of the crease. Melnick tipped the puck under Adam Huska on a change-up shot, as the puck sat just across the goal line at the 6:13 mark of the period. Belpedio struck again 1:24 later, hitting the corner of the net from the slot for an unassisted tally. Austin Alger capped the scoring on a late power play, notching his second goal of the season as he slammed home a deflected puck thrown at the net by Conor Lemirande. Thirteen Miami (3-3) players recorded at least one point. Melnick and Sherwood also notched two points. The RedHawks led, 19-3 on the shot clock early in the second period and ended the night with a 44-18 edge. It was the third time in four games Miami recorded at least three power play goals. The RedHawks were 4-for-7 in this game and are 52.4 percent during that stretch. 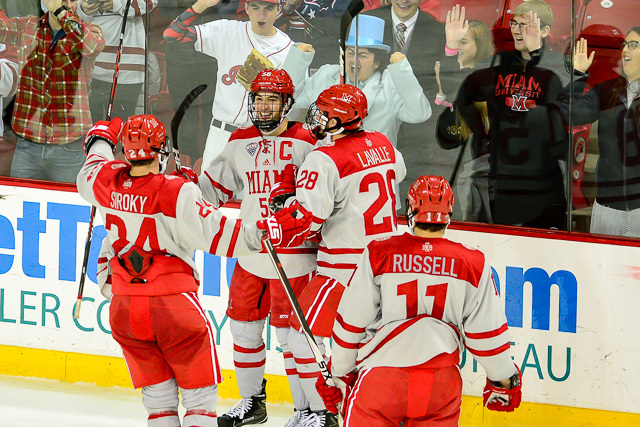 Miami will host Colorado College next weekend as it opens its NCHC slate. The teams will play at 7:35 p.m. on Friday and 7:05 p.m. on Saturday. 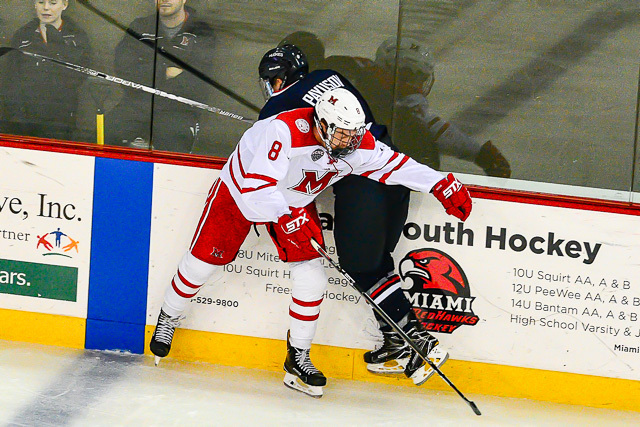 OXFORD, Ohio – The last 50 minutes might not have been the most exciting in Miami history, but with the RedHawks allowing 17 goals the first four games, the shut-down hockey over the final two and a half periods was welcomed. 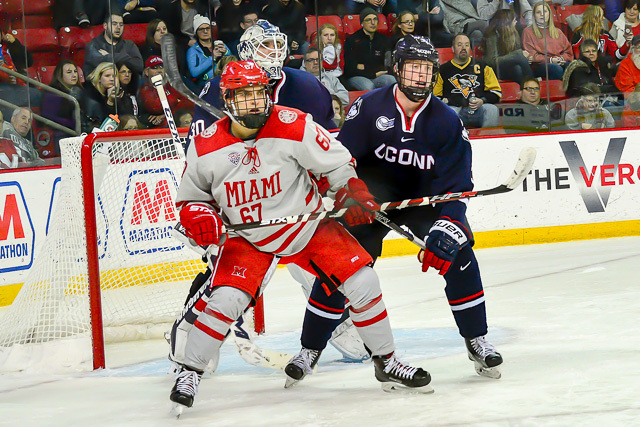 Miami scored three times in the first 10 minutes and coasted to a 3-0 win over Connecticut on Friday. The RedHawks held the Huskies to 11 shots over the final two periods – in other words they did an excellent job of preserving the lead. This weekend’s games are so important because the NCHC season begins next weekend for Miami, which doesn’t want to enter league play under .500. Posting a winning record in this conference is hard enough, the RedHawks don’t need the additional burden of chasing victories against top 10 teams. 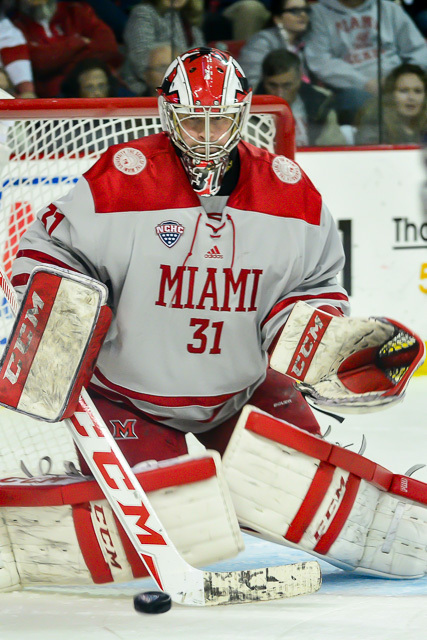 Whatever position in which Miami finds itself during NCHC play, this game had to help the RedHawks gain confidence in their ability to hold a late lead. As exciting of a sport as hockey is to watch, sometimes an unsexy period or two are good for a team. 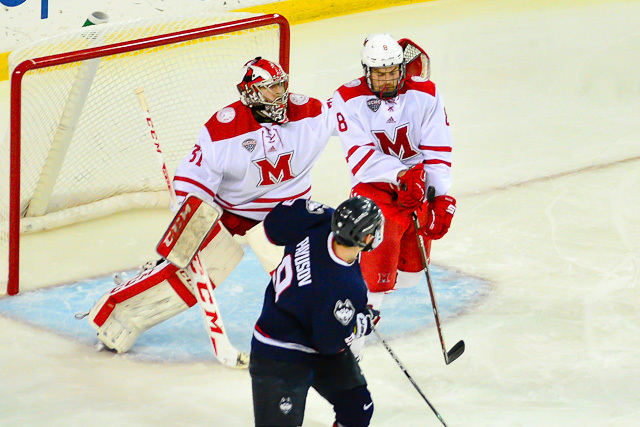 For Miami, the final 40 minutes of defensive, grind-it-out hockey were exactly what it needed. – It must’ve been in Miami’s scouting report to throw the puck at the net from the left side of the blue line. Scott Dornbrock did this twice early in the first period: Once Carson Meyer tipped home a goal and the other time Dornbrock’s shot got all the way through. – Boy did Ryan Larkin need a solid performance. The sophomore entered the weekend with an .840 save percentage and a goals-against average well north of 4.00. He also wasn’t bombarded with A-plus scoring chances. Hopefully with this win Larkin’s confidence sores. So does the confidence of his teammates in Miami’s goaltending, because when the skaters don’t have faith in the guy between the pipes, it can takes players out of their game. – The only downer is that as many NHL draftees as Connecticut has, it wasn’t a very impressive squad. At least it wasn’t very impressive in this game. 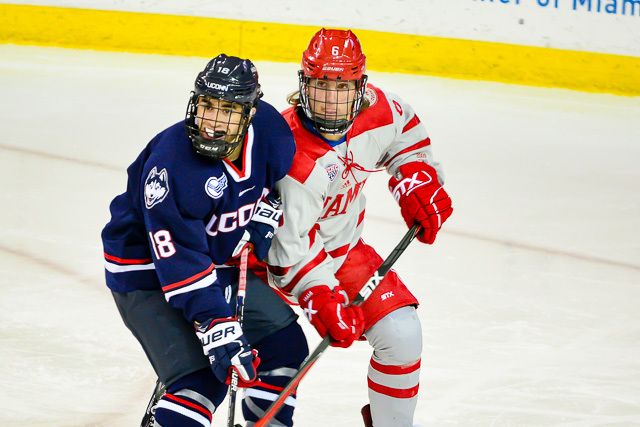 The Huskies didn’t have much of an offensive punch, and they lacked a high level of team speed. One doesn’t get the feeling UConn is going to compete for a Hockey East title. – Realized recently that only one or two file photos are loaded for some of Miami’s newsmakers, so BoB (read here: I) promise to add some very soon. FORWARDS: B-. Not a bad effort. There was nothing doing after the top two lines, really, as forwards not named Gordie Green or Kiefer Sherwood combined for just nine shots. Coach Enrico Blasi has never had any fear of throwing freshmen into the penalty kill, and Casey Gilling et al are doing a solid job. Both goals were sweet to watch: Meyer re-directed one from the slot and Green one-timed a thread-the-needle pass from Josh Melnick for the other marker by this corps. DEFENSEMEN: A. This group not only held its own defensively, helping hold Connecticut to 19 shots and very few of high quality, it is also chipping in on offense regularly. Grant Hutton’s five goals are well documented, and he and Louie Belpedio racked up 10 shots on goal between them. Dornbrock scored on a beautifully-placed wrister. The freshmen are playing somewhat conservatively but aren’t making mistakes. Four shots allowed in the third period with a three-goal lead is pretty much optimal. GOALTENDING: A. There were only a few good scoring chances for UConn, but Larkin looked his old self, playing technically sound but with lightning reflexes and top-notch instincts. 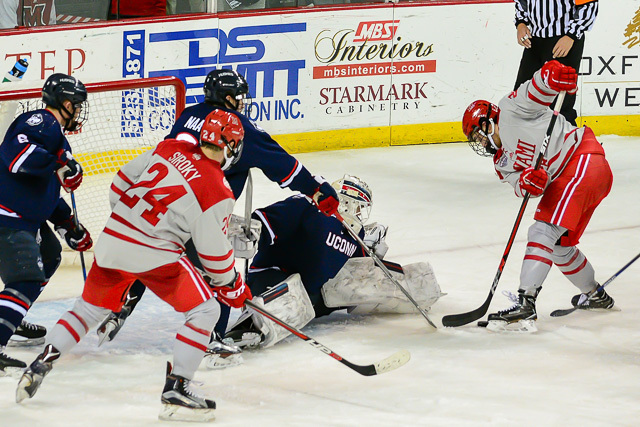 Most of the Huskies’ good chances came early, and Larkin made the necessary stops late to preserve the shutout. His rebound control was outstanding as well. LINEUP CHANGES: On defense, Mahalak was back in the lineup after being scratched for the finale in Maine. Up front, Zach Lavalle and Ben Lown returned the ice, as Alex Alger and Christian Mohs did not dress. OXFORD, Ohio – Arriving late for Miami’s inaugural game against Connecticut would have been ill-advised. 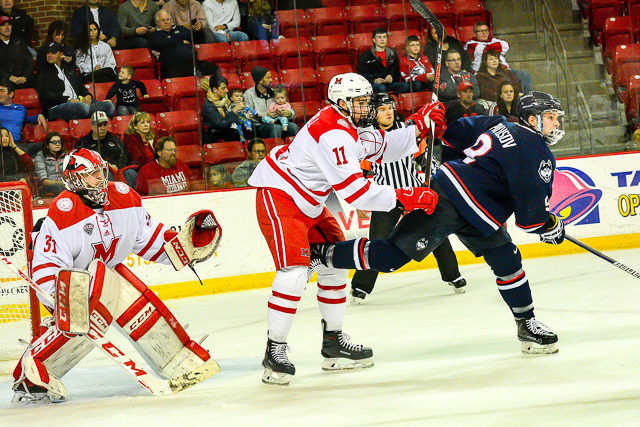 The RedHawks scored three goals in the first nine-plus minutes and Ryan Larkin stopped all 19 shots he faced in a 3-0 win over the Huskies at Cady Arena on Friday. Miami’s Scott Dornbrock (photo by Cathy Lachmann/BoB). 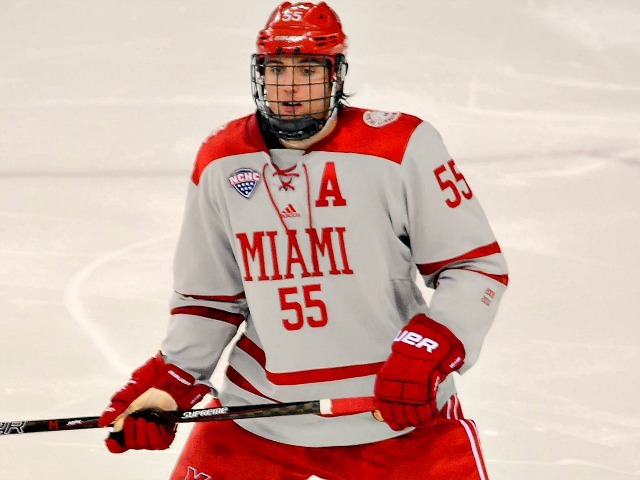 At the 3:52 mark of the first period, Miami’s Scott Dornbrock wristed a shot from the blue line that Carson Meyer redirected from the slot and into the net. Just 1:36 later, Dornbrock lit the lamp from near the same spot off a drop pass by Casey Gilling, extending the RedHawks’ lead to two. With 10:53 left in the opening stanza, Gordie Green buried a shot from the slot on a one-timer, as Josh Melnick fed him a pass from along the boards through traffic. That was it for the scoring despite both teams having four power plays. Huskies goalie Adam Huska left the game late in the third period after going down awkwardly, appearing to suffer some type of lower-body injury. He was replaced by Tanner Creel, who stopped both shots he faced. 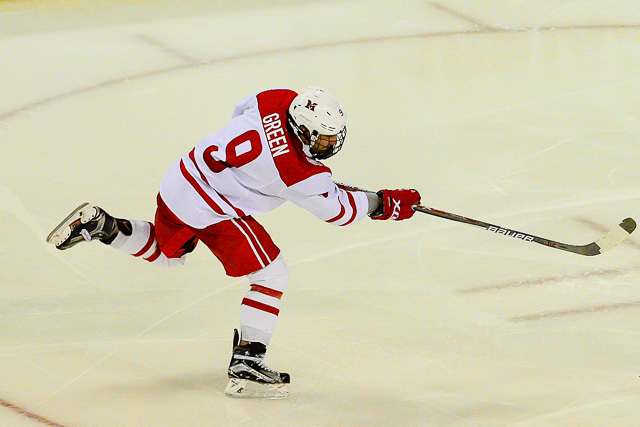 Green now has eight points on the season, taking solo control of first place on the team. Dornbrock finished with a goal and an assists, his third career two-point game and his first with a 1-1-2 line. 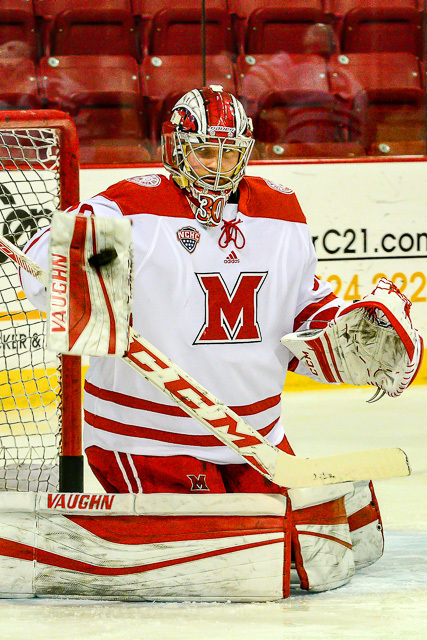 It was Larkin’s second career shutout, with his other coming against Maine on Oct. 22. The teams wrap up their weekend series at 7:05 p.m. tonight. 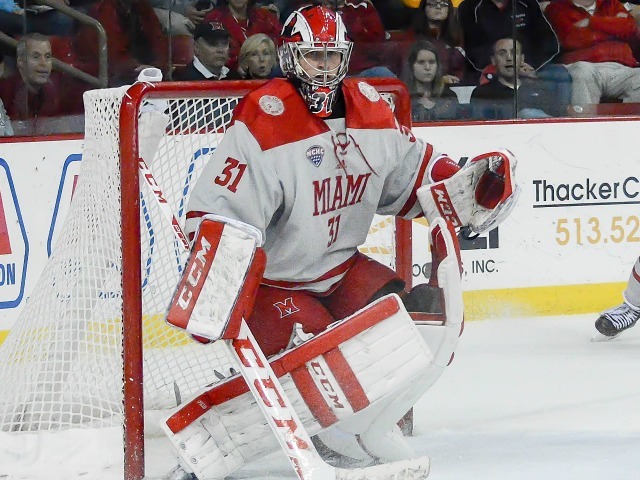 WHO: Connecticut Huskies (2-3-1) at Miami RedHawks (1-3). 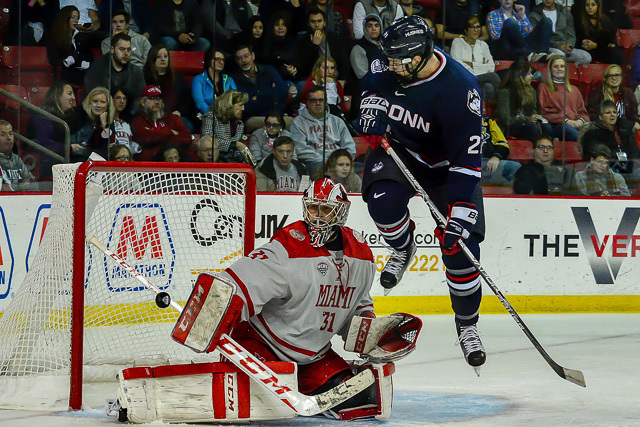 WHEN: Friday, 7:35 p.m.; Saturday–7 p.m.
NOTES: Strange that a pair of Division I teams in a tier of 60 have never met, but Friday will represent the inaugural contest between UConn and Miami. The Huskies went Division I in 1998-99 and won 20 games that season, but they have not reached that high-water mark since. They have also never advanced to the NCAA Tournament. Current coach Mike Cavanaugh took over prior to 2013-14 – UConn’s final season in the Atlantic Hockey before joining Hockey East – and after an 18-14-4 debut, his teams have not posted a winning record since. Like Miami, the Huskies split with Maine. 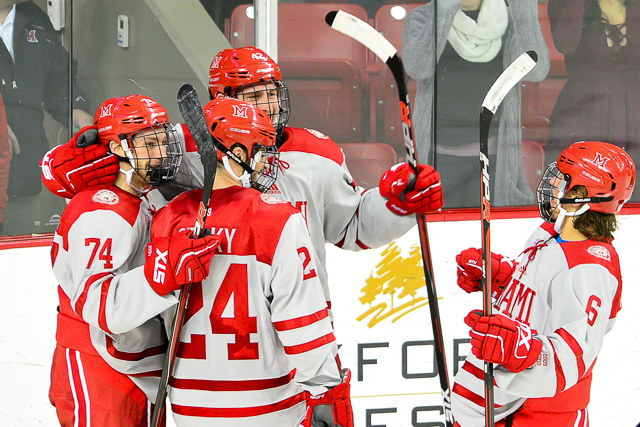 After that season-opening series, they beat American International and lost to Sacred Heart then went 0-1-1 in a home-and-home with Boston University. Connecticut has had no problem generating offense, averaging 3.3 goals and 35.3 shots per game. 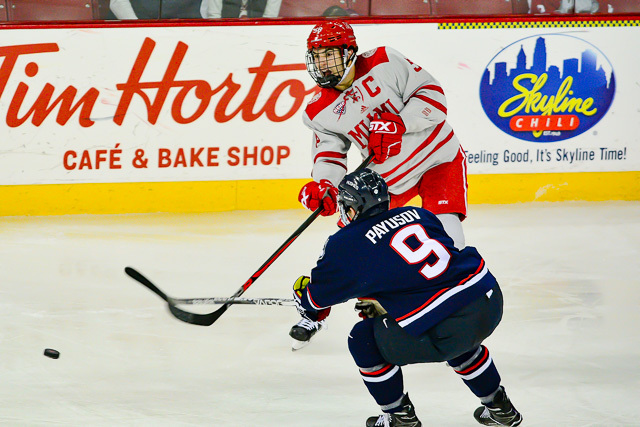 F Alexandre Payusov was limited to two points in 15 games as a freshman, but he is 6-2-8 in six games to start 2017-18, leading all UConn forwards in goals and points. Like Payusov, Karl El-Mir is from Montreal, and he has a pair of goals and four assists. Maxim Letunov, a second-round pick of San Jose, also has six points (1-5-6) and Kasperi Ojantakanen and Spencer Naas have recorded four points. At defense, Johnny Austin has one goal and team highs in assists (8) and points (9) – his point total is tied for second among D-I blueliners – although the senior’s career high at UConn is 10 points last season. 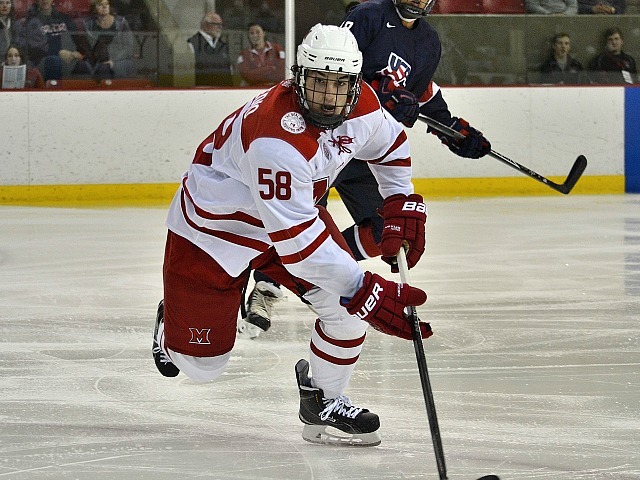 Derek Pratt has a goal and three assists, and four NHL draftees – Miles Gendron (Ottawa), Philip Nyberg (Buffalo), Joseph Masonius (Pittsburgh) and David Drake (Philadelphia) also patrol the blue line for the Huskies. The Huskies are outshooting opponents by nearly five shots per game, yet they have a goal differential of zero. Which means UConn is not stopping the puck at a high enough clip. Starting goalie Adam Huska, a seventh-round New York Rangers pick in 2015, has a .905 save percentage and a 2.95 goals-against average. Backup Tanner Creel was solid two years ago in relief but started against America International and allowed three goals on seven shots. Like Miami, UConn is executing at a 33.3 percent rate on the power play, tied for fifth in the NCAA, but the Huskies are tied for 42nd with just a .722 penalty killing clip. 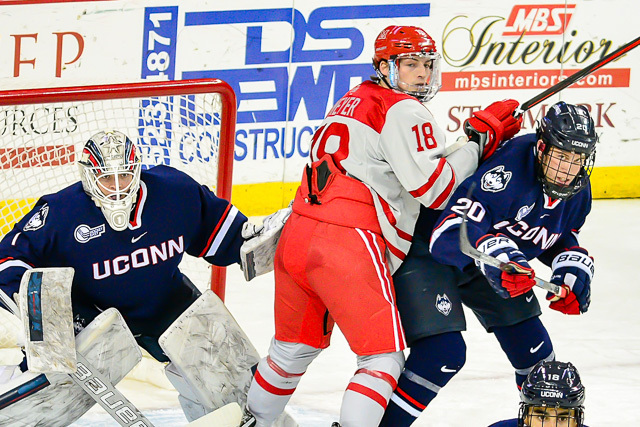 Connecticut has outscored its opponents in the final two periods but has struggled early, as it has netted just three goals while allowing 10 in the opening 20 minutes. This series begins a crucial four-game homestand for Miami. These are extremely winnable games for the RedHawks, as are next week’s tilts against Colorado College. If Miami is unable to thrive against these opponents, it could be a long season. UConn and CC were a combined 15 games under .500 in 2016-17. The RedHawks are currently two games under .500, and the schedule gets a lot harder following these two series. 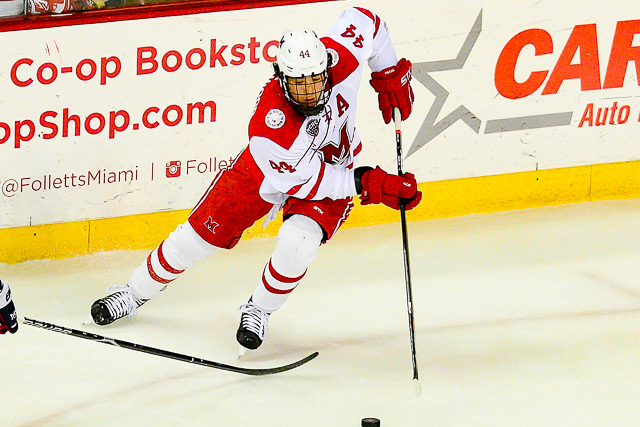 A four-goal second period was crucial in Miami’s win on Friday. 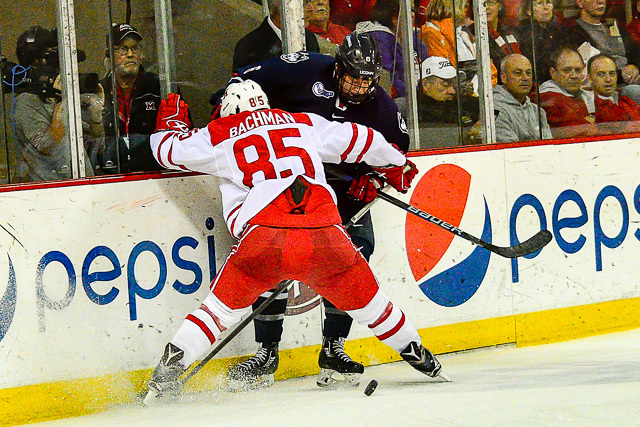 A day later, a five-tally opening frame was the RedHawks’ demise. 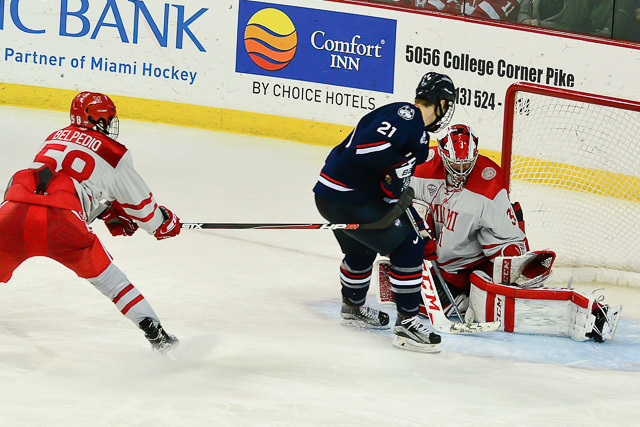 Maine scored the first five goals and held on for a 6-3 win over Miami in a penalty-laden series finale on Saturday. The two-game set saw 19 goals scored 115 penalty minutes assessed. The RedHawks (1-3) won the opener, 7-5, earning a weekend split. It took the Black Bears (2-2) just 1:01 to register a marker. 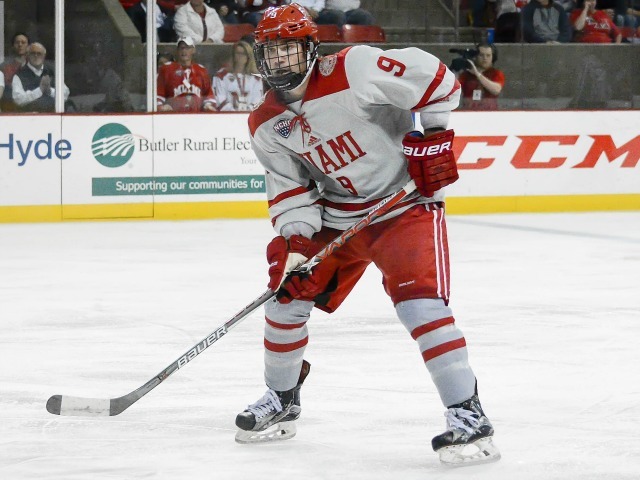 Eduard Tralmaks took a long neutral-zone pass, crossed the blue line along the boards, skated around a Miami defender and tucked the puck inside the far side of the net. Just 1:21 later on a 5-on-3, Patrick Holway scored on a blast from the slot that snuck inside the post on the stick side. 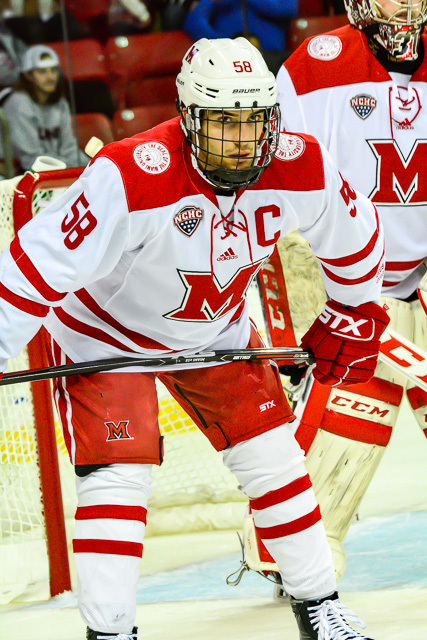 At the 8:07 mark of the first period, Tralmaks fired a pass across the high slot to Brady Keeper, who ripped one past Miami goalie Ryan Larkin from the top of the faceoff circle. Less than three minutes later, Patrick Shea shoveled home a slap pass from the side of the net off a feed by Holway. Exit Larkin, as the standout had stopped just 7 of 11 shots. Enter Grant Valentine, who made his RedHawks debut. With 2:13 left in the first frame, Maine again capitalized on a two-man advantage. A shot from Mitchell Fossier snuck through Valentine’s pads. Larkin was back in net for the final two periods. Miami did get one back before the first 20 expired. Defenseman Grant Hutton threw a puck toward the net, and it hit a stick or skate and caromed to a wide-open Phil Knies, who deposited it in the net for his first collegiate goal with five seconds remaining. Midway through the second period, Maine’s Emil Westerlund sent a pass from behind the Miami net to a wide-open Tim Doherty, who skated around Larkin and tapped it home to make it 6-1. The RedHawks cut the deficit to four with 3:47 left in that stanza, as Louie Belpedio teed up Grant Hutton from the center of the faceoff circle, and his blast beat Black Bears goalie Jeremy Swayman on the glove side. Miami pulled its goalie in the final minutes, and Hutton connected again when he whipped a wrist shot into the far side of the net. Hutton finished with two goals and an assist, giving the blueline four markers and a helper for the weekend. Knies ended the game with a goal and an assist, and Gordie Green picked up a pair of assists, giving him a 2-5-7 line for the weekend. The RedHawks were 3-for-5 on the power play and were 7 of 10 for the series. There were a pair of skirmishes after the outcome was no longer in doubt. 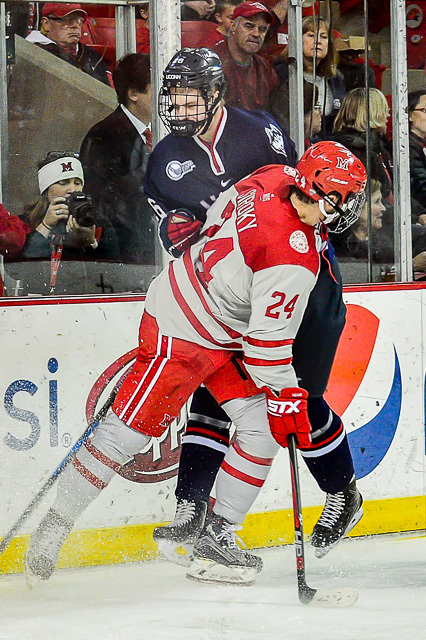 Green, Carson Meyer and Rourke Russell were all assessed roughing minors after a pushing-and-shoving incident in the second period. Belpedio and Keeper were given game misconducts for a dust-up midway through the third period, as 89 combined penalty minutes were dished out. 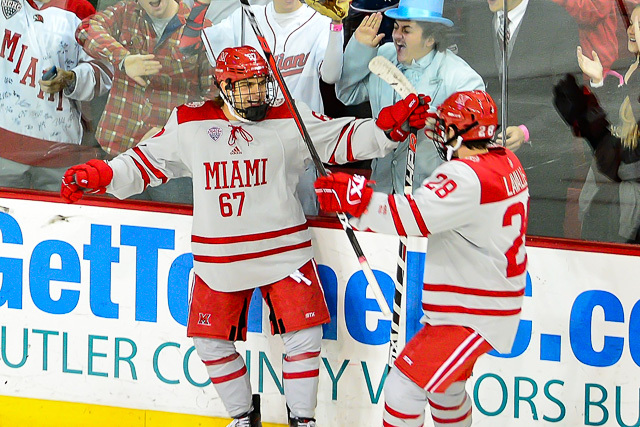 Miami returns home to face Connecticut in a weekend series on Friday and Saturday. Miami made its first win in nearly nine months a memorable one. 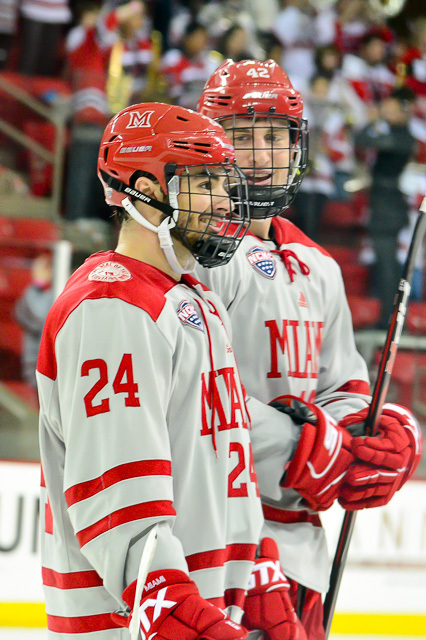 Thanks to an explosive power play and career-best five points by Gordie Green, the RedHawks scored seven times in the first 40:08 and held on for a 7-5 win at Maine on Friday. 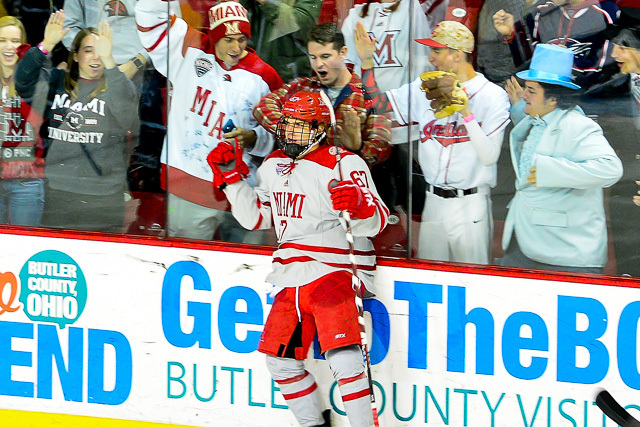 The last time Miami (1-2) had ended up in the victory column was Jan. 28, as the team snapped a 12-game winless streak during which MU went 0-11-1. The RedHawks had not scored seven goals in a game since Jan. 23, 2016, but Green’s feat was much more rare. The last five-point game by a Miamian was Nov. 30, 2013, when Austin Czarnik dished for five assists. 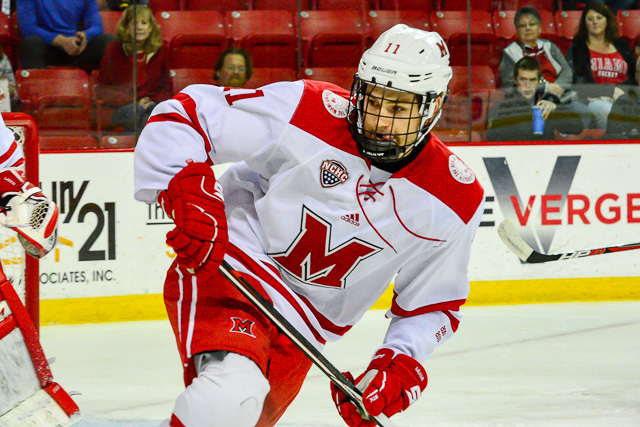 Miami opened the scoring with one second left on a power play, as Josh Melnick slid a pass from behind the boards to Gordie Green, who quickly hit Karch Bachman in the slot for a one-time, top-shelf blast 5:16 into the first period. Just 19 seconds later, Green skated toward the net, eluded goalie Rob McGovern and tucked it into the corner of the net to make it 2-0. Defenseman Grant Hutton buried a one-timer from the faceoff circle off a slot pass by Green, extending the RedHawks’ lead to three less than two minutes into the second period. Maine (1-2) got on the board on a wrister by Veli-Matti Tiuraniemi, and the Black Bears made it a one-goal game as a Mitchell Fossier shot hit a Miami skate and tricked over the goal line. Both goals came in a 91-second span midway through the second period. Hutton made it 4-2 with a blast from the same spot as his first goal, as he slapped one through traffic with 7:27 remaining in the middle frame. But Maine refused to go away. Fossier knocked down a pass at the top of the crease, move it to the top of his stick and bat it past RedHawks goalie Ryan Larkin with 3:41 left in the second stanza. That was the fifth marker of the period, and Miami would strike for two more in the closing minutes. A give-and-go between Green and Kiefer Sherwood ended with Sherwood shoveling one just under the crossbar from the side of the net with 2:16 left in the period. And 1:10 later, Scott Dornbrock teed one up for Louie Belpedio in the high slot, as his one-time rip made it 6-3. 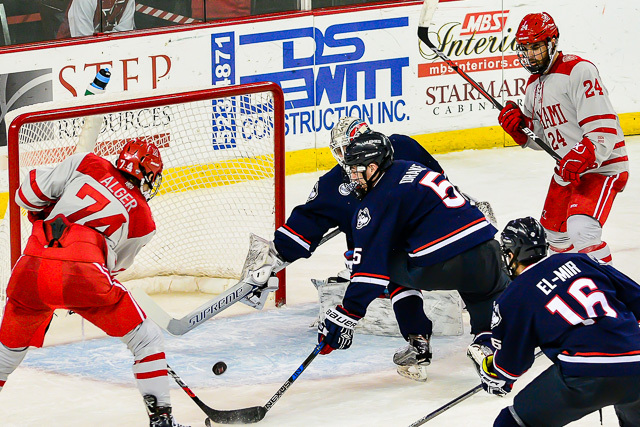 The RedHawks took their largest lead of the game with their final goal eight seconds into the third period. Carson Meyer stole a pass at the blue line and connected with Green, who went in alone and beat backup goalie Jeremy Swayman on the forehand. Maine pulled to within two on a slap shot from the blue line by Eduard Tralmaks and a head-hunting shot by Rob Michel. 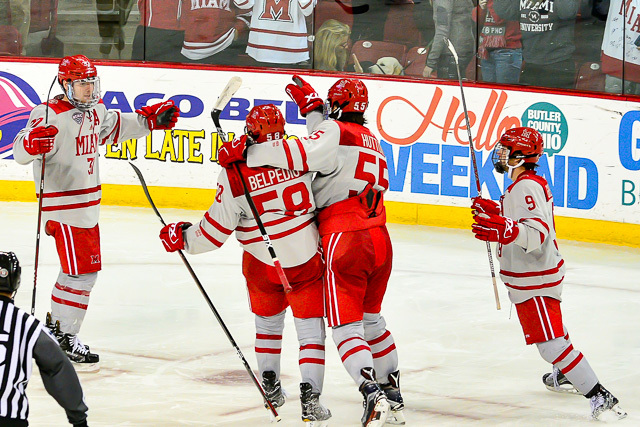 Miami finished 4-for-5 on the power play as the RedHawks recorded four PPGs in a game for the first time since Jan. 25, 2014 vs. Colorado College. 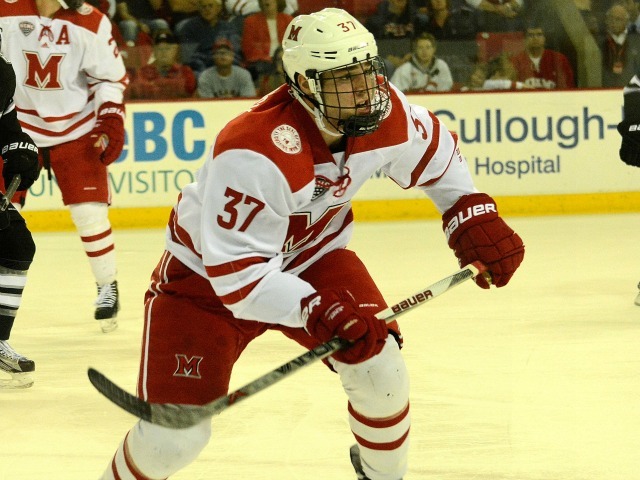 Melnick ended up with three assists – his first career three-point game – and Hutton had never scored two goals as a RedHawk. Sherwood and Belpedio also notched two points, both with a goal and an assist. These teams wrap up their weekend series at 7 p.m. on Saturday.